The amygdala is an almond-shaped mass of nerve cells lying deep in the cerebrum of the brain. It is concerned with decoding emotions, and in particular stimuli that are threatening to the organism. As a result of evolution, many of our body's alarm circuits are grouped together in the amygdala. Consequently, many sensory inputs converge in the amygdala to inform it of potential dangers in its environment. This sensory information comes to the amygdala either directly from the sensory thalamus or from the various sensory cortexes. 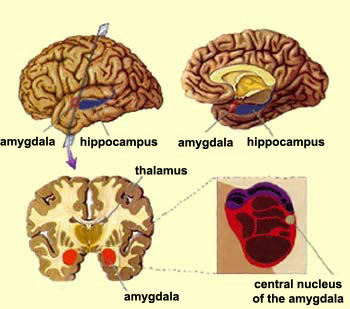 The amygdala also receives numerous connections from the hippocampus. Since the hippocampus is involved in storing and retrieving explicit memories, its connections to the amygdala may be the origin of strong emotions triggered by particular memories.